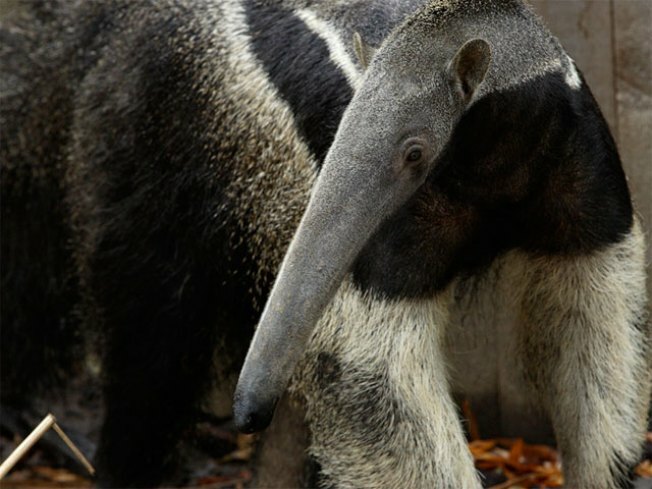 Someday he'll have a two-foot-long tongue, but right now, the brand-new giant anteater is just working on eating and growing. He entered the world on Dec. 7, the ;National Zoo announced today. Female Maripi bred with male Dante in April, May and June, and vets had been performing weekly ultrasounds since June to monitor Maripi and her baby's progress. The father, Dante, is separated from them, and will not be involved in the baby's upbringing, whichi is what happens in the wild. Staff monitored the birth via remote video camera so they wouldn't disturb the process. Within 20 minutes of being born, the baby begin to climb up his mom's tail, as expected -- but then they hit a few bumps in the road. However, early the next morning, the baby was found outside of the nest with a low body temperature while mother was asleep in the nest. The newborn was taken to the Zoo's vet hospital, where he received a complete medical evaluation that included a controlled raise of his body temperature. As a precaution, Maripi was also taken to the vet hospital and given a complete medical evaluation. They remained under observation until this morning when they returned to their habitat. The baby has been gaining weight and behaving normally. "Thanks to the quick response by the keepers and vet staff the morning after the pup's birth -- coupled with continuous attention over the past few weeks -- the two look like they are gaining strength each day. We are not completely out of the woods yet, but remain cautiously optimistic for a complete recovery," said Craig Saffoe, curator. The newborn is Maripi's third offspring. In 2007 she gave birth to a female, Aurora (who now lives at the Zoo Parc de Beauval in France) and in 2009, a male, Cyrano (now at the Nashville Zoo).